Situated within walking distance to amenities, schools and handy for the local bus routes, with the additional benefit of two parking spaces, is this two bedroom semi detached house. This electrically heated and sealed unit double glazed property that briefly comprises on the ground floor of living/dining room and a modern fitted kitchen. On the first floor are 2 bedrooms and a bathroom with a white suite. 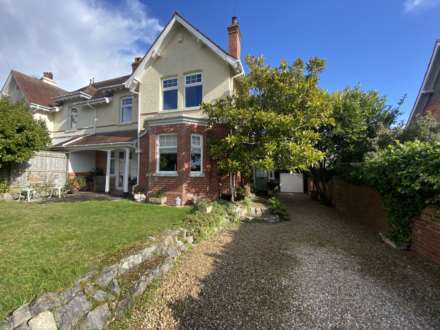 The property further benefits from an enclosed and easy to maintain rear garden. This property would make an ideal investment/first time purchase. Night storage heater. Laminate style flooring. Telephone point. Dado rail. Stairs rising to first floor landing. Doors to kitchen and Living room. Double glazed sliding patio doors which open into the rear garden. Night storage heater. Coving to ceiling. Television point. Wall lights. Under stairs storage cupboard. Laminate style flooring. Double glazed window to front aspect. The kitchen is fitted with a matching range of floor and wall mounted cupboard and drawer units with under unit lighting and work surfaces over. Complimentary wall tiling. Single drainer stainless steel sink unit with mixer tap over. Space for cooker, fridge/freezer and washing machine. Dado rail. Coving to ceiling. Loft access via retractable ladder. Doors to bedrooms and bathroom. Double glazed window to rear aspect. Electric heater. Coving to ceiling. Double glazed window to front aspect. Built in wardrobes with hanging rail and storage. Airing cupboard built over the stairwell, currently housing the water tank. White suite comprising: Panelled bath with hand grips and shower over, shower rail and curtain. Pedestal wash hand basin. Low level WC. Complimentary wall tiling. Dimplex electric wall heater. Extractor fan. To the front of the property there is a small patio garden edged with stones and a cold water tap. To the side there is tandem parking for two cars. A wooden pedestrian gate to the side gives access to the low maintenance rear garden, with a patio seating area and timber garden shed. Mains electric, drainage and water although we have not verified connection. Council Tax Band B. From Exmouth town centre proceed into Exeter Road and take a right hand turning into Withycombe Road and continue until the roundabout. Turn left at the roundabout and then right at the next mini roundabout into Withycombe Village Road. Continue along the road and take the 2nd right, into Moorfield Road and then the first left into Nursery Close. The property will be found half way up the road on the left hand side, clearly identified by our For Sale sign.